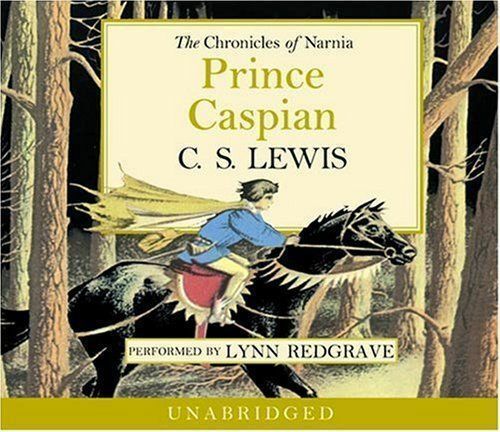 Remember my re”reading” of the Narnia series via audiobook? Today we’re on to Prince Caspian, book 2 (or 4, depending how you count it). This is the second book focused primarily on the Pevensie children, Peter, Susan, Edmund and Lucy. They make their second trip to Narnia, only to find that hundreds of years have passed during, for them, the intervening year. They eventually join up with Prince Caspian, rightful heir to the throne, who has gathered an army of Old Narnians (fauns, talking animals, dwarfs and the like) to fight his wicked uncle, King Miraz. This was an interesting one for getting to know the Pevensie characters better. Peter had a bit of lordly leadership to him, but I wound up feeling pretty neutral on him, neither liking or disliking him much. Susan was quite frankly a wet blanket. Edmund and Lucy emerged as the most interesting and complex of the group. Edmund has grown much more likable since his nastiness of the previous book, while that past history gives him…well, a history! There’s still the sense that he has shadows to overcome, and that doing the right thing is, not a struggle, but perhaps a conscious choice. Lucy of course is lovely, heart always in the right place and often having beautiful moments, but never too perfect either. I think it was really Caspian that I liked best, or at least his story. The Pevensies’ adventure was good, but I particularly enjoyed the flashback story of how Caspian learned the stories of Old Narnia, fled from his uncle, and met wonderful, magical creatures in the process. I’m not quite sure how I feel about the Pevensies’ adventure in some ways…I enjoyed it, and it was thought-provoking, which is good–except that I don’t feel like Lewis explored a lot of those thoughts! The children return to Narnia to find the crumbling, abandoned remains of the castle where they had once ruled as Kings and Queens, during the Golden Age. They ruled for years and years, and for them all those memories are only a year ago. To return and find that hundreds of years have gone by and the Golden Age has most decidedly past…well, it ought to prompt all kinds of sorrow about lost friends and lost times, and reflections on the meanings of our deeds, and the changes of the world. I had some of those thoughts, but I would have liked to see the characters have more of them too! Next on the list, Voyage of the Dawn Treader, which is one of my favorites! Such an interesting reread! Honestly, the only ones I remember that well are The Magician’s Nephew, Lion Witch and Wardrobe, and The Horse and His Boy, which was my favorite in the series. The others blurred together. I should rewatch the film…I felt like I remembered more reflection in the book than I actually found there, but maybe I was remembering conversations from the movie!